Public engagement is central to BEACON’s mission. The Center supports these efforts through Education & Diversity budget requests; dedicated postdoctoral positions for public engagement, science education, and diversity; support for engagement events and the development of educational materials; and more. It should, therefore, come as no surprise that BEACONites engage with the public about STEM topics in many different ways. How many? We’re glad you asked! In November 2016, we sent a survey out to the entire BEACON community to find out. Ninety-three BEACONites responded from seven different Universities: Michigan State (54%), The University of Texas at Austin (20.4%), University of Idaho (10.8%), University of Washington (8.6%), North Carolina A&T State University (3.2%), Yale (1.1%), and University of California, Irvine (1.1%). Most were biologists (71%), computer scientists (16.1%), and neuroscientists (6.5%). Participants represented a range of career stages (Fig 1a), from undergraduates to faculty and staff, and experience levels (Fig 1b), from no experience to more than 50 public engagement events, thus far! Using a list of public engagement activities generated at our BEACON Congress Sandboxes in 2016, we asked participants about the many ways they have engaged with the public, from hosting a podcast to judging a science festival to writing a popular science book. We then categorized the 31 engagement activities, a priori, as face-to-face engagement with K12 students and/or adults; public interviews on a variety of platforms (e.g., newspaper, television, podcast); producing media of various kinds (e.g., blog, online video, book); facilitating engagement for others (e.g., as an organizer of a public engagement program or BEACON public engagement, science education, or diversity postdoc); facilitating research experiences (e.g., mentoring an undergraduate or high school research assistant), or engaging with public policy and policy makers (e.g., serving as an elected official, registering an opinion in state or local government). Participants could also indicate that they had not yet engaged with the public. 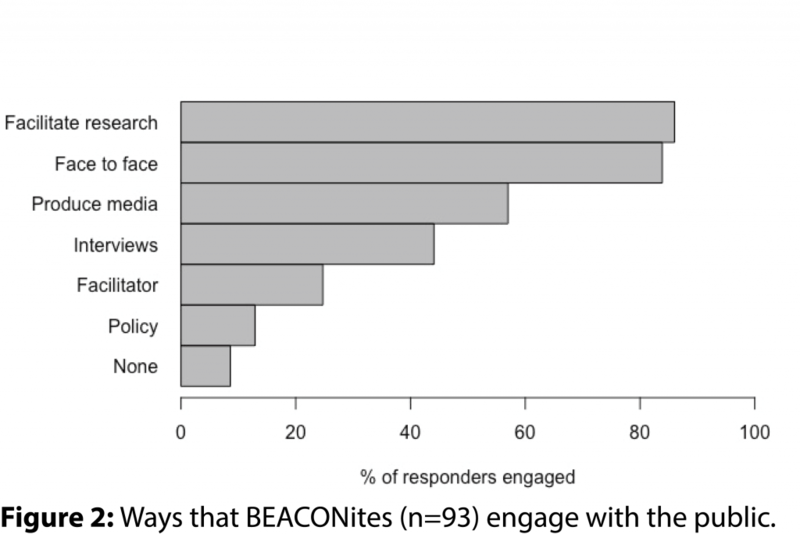 There were marked differences in the ways that BEACONites engage with the public (Fig 2). More than 80% of participants had engaged with the public face-to-face or by facilitating research experiences for others. These data are informative because it allows us to identify engagement activities that scientists are attracted to and/or that are more accessible. For example, the most popular face-to-face activities were K12 classroom visits (51%), organizing or presenting at a science festival or expo (44%), and organizing or giving a lab or core facility tour (43%). With this information, BEACON and public engagement organizers can ensure that appropriate training and popular engagement opportunities are available. We also identified public groups that are not being reached. For example, engagement with policy and policy makers was strikingly underrepresented. Less than 20% of participants had served in elected office, communicated with policy makers about STEM topics, or communicated with local school boards, parent teacher associations, or home school communities. This finding is especially significant in the current political climate. Influential voices in both government and media are amplifying false scientific claims made by vocal public groups (e.g., anti-vaxxers, anti-GMOers, climate change deniers, and creationists), which can sway policy decisions and impact lives and livelihoods. BEACON does not currently have any public engagement training or programs that focus on policy, but plans are in the works to address this important type of engagement. In the meantime, check out resources from the AAAS Center for Public Engagement with Science & Technology, the Engaging Scientists & Engineers in Policy (ESEP) Coalition, and 314 Action. Most survey participants indicated that they had engaged the public through multiple activities, for example, visiting a K12 classroom and hosting radio show. Therefore, we were also interested in whether there were patterns to the different kinds of activities in which individuals participated. Hierarchical cluster analysis suggests that the suites of activities individuals participated in may cluster in meaningful ways (Fig 3), indicating that those activities may share particular qualities. To begin making sense of these shared qualities, we labeled each activity based on 1) our a priori categories (Fig 2), 2) if it necessarily involves K12 students, and 3) if it requires in-person interactions. Individuals may have fundamental preferences for the type of audience they engage with (children vs. adults) and the format of the activity (e.g., in person vs. online). Several interesting patterns stand out. First, the three major clusters (Fig 3, A, B, C) are made up of distinct mixes of categories. Cluster C contains the majority of the face-to-face, interview, and facilitating research activities. 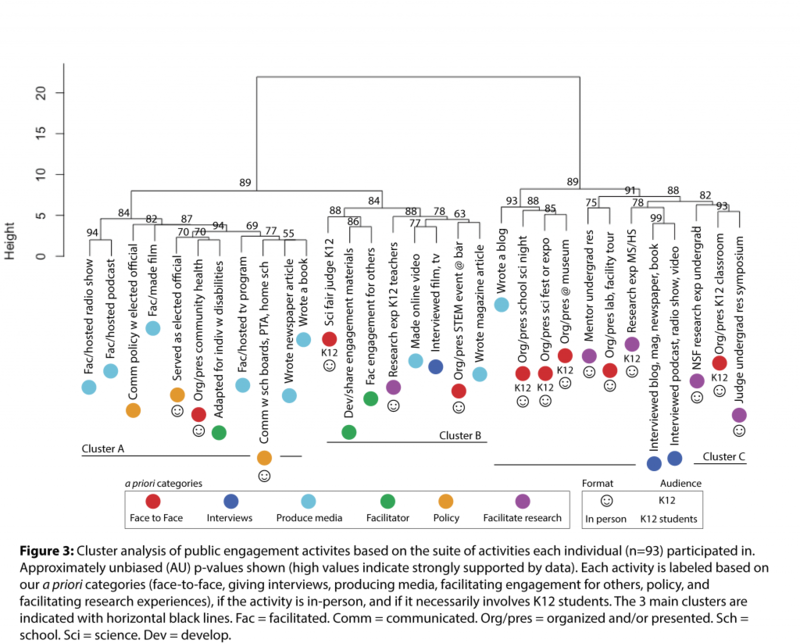 In comparison, cluster A is primarily policy engagement and producing media. Cluster B is a mix. Second, category, audience, and format interact. For example, cluster C contains the majority of face-to-face, in-person, and K12 engagement activities. Cluster A contains no engagement activities that necessarily involve K12 students, and cluster B only contains one. Third, specific activities appear to be distinct from others in their a priori category. In cluster A, adapting materials for individuals with disabilities and engaging the community about health are clearly distinct from the other facilitating engagement and face-to-face activities, respectively. Similarly, giving interviews for television or film did not cluster with giving interviews for written works, podcasts, radio, or online video. As we continue to analyze these data, other factors may become important, as well, such as the level of investment required. Although we are working with a limited sample size, we aim to use this kind of data to inform our public engagement efforts and spending. On a personal level, we could also use these data to make personalized recommendations for future public engagement based on an individual’s previous activities. For example, someone may be interested in branching out to a new, but similar, form of engagement. Or based on my own engagement experience, which includes the activities in clusters B and C, but only one in cluster A, I could expand to a new activity but a familiar format. Long-term, our goal is to fundamentally change how and why scientists learn to communicate with diverse and influential audiences. Effective STEM public engagement may be central to ensuring the future of scientific research in these uncertain times. If you haven’t had a chance yet to participate in our short survey (< 4 min), you can tell us about the ways you engage by clicking here! This entry was posted in About BEACON, BEACON Researchers at Work, Education and tagged BEACON Researchers at Work, communication, diversity, Education, Outreach. Bookmark the permalink.